Compiled by D. L. Ashliman. Copyright 1999. Linguistic note: the letter Þ (lower case þ), which may not reproduce on your computer, is called a "thorn" and is pronounced like the unvoiced "th" in the English word "thorn." Modern Icelandic: Fimmtudagur [fifth day]. After Iceland became Christian most of the older heathen day names were replaced with numbered day names. Lay of Thrym from the Poetic Edda. The Norse god Thor recovers his stolen hammer Mjölnir from the giant Thrym. Thor in Vinland. A Viking explorer spending a harsh winter in Vinland (America) offers a gift to Thor and is rewarded with a beached whale. Boniface and the Oak of Donar [Thor]. A Christian missionary cuts down a tree sacred to the German heathens. Thor and the Midgard Serpent from The Prose Edda of Snorri Sturluson. The hammer's name is sometimes given as Mjöllnir. Thor's hammer amulets. 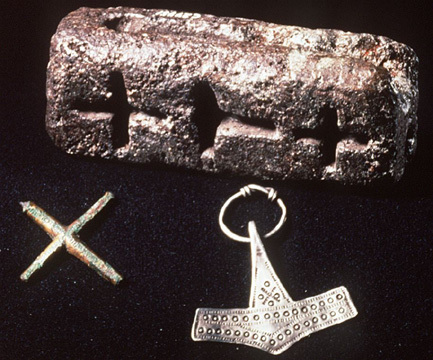 About 50 amulets shaped like Thor's hammer have been discovered in the modern era. This site features photographs of a representative sample of these important symbolic items. 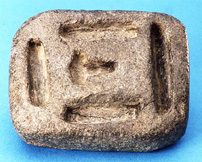 Soapstone mold found in Egholm, Denmark. This mold was used to cast Thor's hammer amulets as well as small ingots of different size and value. Thor's Hammer / Christian Crucifix Mold. This tenth-century soapstone mold, found at Trendgården, Jylland, Denmark, could be used to cast either heathen or Christian amulets. Numerous sagas and historical accounts refer to the conflict between heathenism and Christianity, The hammer and the cross were very important symbols in this conflict, and the silversmith or goldsmith who used this mold could satisfy customers of either faith. The Blue Belt. A folktale from Norway, collected in the mid nineteenth century by Peter Christen Asbjørnsen and Jørgen Moe. The magic belt in this tale is reminiscent of the Norse god Thor's belt of strength as described in The Prose Edda of Snorri Sturluson. Thor's Hammer in the Alps. A superstition recorded in 1897. The Challenge of Thor. A poem by Henry Wadsworth Longfellow. Please check back soon for more information about Thor. Table of Contents for Thor's Home Page.